In this audio sample, Bill Tutton explains what he sees as the lasting, positive effects of the Sunset Junction Street Fair, designed to bring together various demographics in Silver Lake. Conflicts between Latinx and gays characterize Silver Lake's history, but the story is more complicated than simple displacement of which Florida speaks, in part because queer and Latinx residents simultaneously took advantage of straight "white flight" starting in the 1950s. 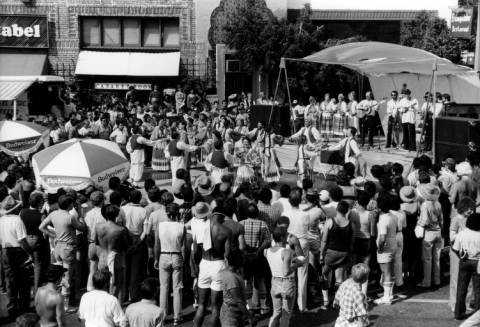 The Sunset Junction Street Fair was designed in 1980 to mediate tensions between the Latinx and gay communities that co-occupied the neighborhood. The fact that the festival lasted thirty years, on the one hand, speaks to its success and, on the other hand, may have inadvertently exaggerated the friction as an intense and lasting one. While the neighborhood did experience purportedly anti-gay incidents and (gang violence was indeed a problem for all residents, certainly more for Latinx families than LGBT* residents), the simplistic narrative of gays vs. gangs occludes the intersectional existences of the neighborhood's Latinx queer subjects like our narrator Alvaro Vega. Our oral history narrators shared their anecdotal accounts of racial relations in the neighborhood, spanning from Joseph's testimony from the 1970s to MW's in early 2000s. Spanning from 1980 to 2010, The Sunset Junction Street Fair arguably fulfilled its intention of bringing together the diverse demographics of the neighborhood, in the beginning. Financial and permitting problems eventually shuttered the festival. More broadly, our narrators speak about the festival's rise and fall as a synecdoche for Silver Lake's gentrification.